A Christian Nation? Since When? – NYTimes.com. ← History News Network | More than 80,000 People Died and Hardly Anyone Paid Attention? Thank you for the great post. I wish I had read it when you wrote it. After reading and listening to famous preachers and popular Christians, I believed America had a Christian heritage. In numerous books, I read the founding fathers were Christians and they instilled the beliefs in the constitution. I have read numerous reviews of the book and it’s spoken highly of. 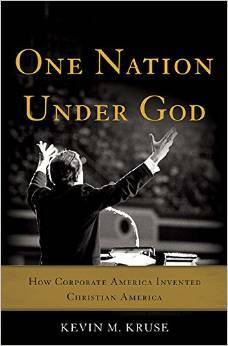 I came across Gregory A. Boyd’s The Myth of a Christian Nation it is equally good, although written with specifically Christians in mind. I have also written two posts on whether America is a Christian nation. I hope you will look at it. Your views are greatly appreciated. Thanks for your interest in the post! I don’t have time at the moment to respond to your post, but I’ll try to get to it as soon as I can. But I will say that the evidence does not support the claim that this is a Christian nation except in the sense that the majority claim to be some sort of Christian. I currently working on a book on the Religion Clauses of the First Amendment. I have posted some related blog posts on the subject (see post on John Leland, Thomas Jefferson, and James Madison).